Would you be comfortable just with your cell phone or do you need the clearer and dependable landline? Consumers are dropping landlines for their cell phones, but you should think twice before following them. You get more features with landlines than the popular cellphone. They have better sound quality, dependable reception, and have better coverage. There are almost no instances of dropped calls as you converse. 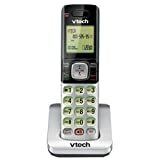 The cordless phone provides you similar freedom of movement cellphones but with a better call quality. As you choose your next cordless phone, you should consider a few factors. This guide will make it easy for you to make the right decision and go home with the phone that will serve your needs well. 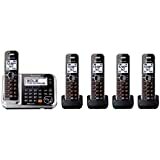 Buy now from Amazon When you buy this cordless phone you get two cordless handsets and the chance to expand. It reliable and smart, making your home or office call management easy. The 1.6-inch display clearly shows who’s calling and easily dial with the backlit handset keypad. This phone features call blocking capacity to eliminate unwanted calls. You can easily program the handset to ring or be in silent mode. Buy now from Amazon Experience working with this DECT 6.0 phone featuring an answering machine and 2 handsets. It is a reliable phone for home or office use. It uses advanced technology making it smart and easily customizable. It is designed to make it easy for everyone to manage everyday calls. It features a loud talking ID so you can hear who’s calling from far. Its text-to-speech system works in English from both the base unit and the handset. The white backlit display will show you who’s calling and it gets better, you can eliminate unwanted calls by activating call block. Its inbuilt digital answering machine functions reliably making this phone the most reliable in the market. 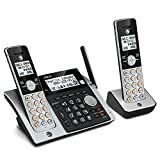 Buy now from Amazon Use this add-on phone to add additional wireless phones to your system. It requires a CS6719, CS6729, CS6829 or CS6859 systems in place to operate. The handset has speakerphone features with caller ID that shows the incoming caller information. It also shows call waiting in case the phone is already in use. Buy now from Amazon If you have a big home, this cordless phone will suit you. Expand it up to five handsets for convenience. The speakerphone feature makes it hands-free and easy to use as you do other things. This allows both ends to speak and hear conveniently. Its extra-large LCD makes reading the caller information easy. In low light conditions, you can easily dial because it is backlit. Those with visual impairment will find it easy to use due to these visual enhancements. The phone sues power-conserving technology to manage consumption for optimal performance. 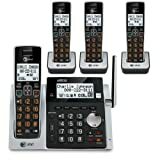 Buy now from Amazon Experience interference-free communication with this cordless phone. Select your favorite ringtone and communicate in a clear environment. The phone displays caller ID and offers digital security to protect you from identity theft. Its caller ID memory can store up to 50 records. Conveniently multitask by activating the speakerphone feature if you are occupied. Walk around freely and still experience crystal clear sound. Its keypad and backlit LCD are user-friendly and can operate in English, French or Spanish as desired. Buy now from Amazon Enjoy the power of this intelligent cordless phone with a Class 1 Bluetooth. It adds the range of your home or office system, therefore increasing convenience. Easily take cell calls from the handset and charge your cell phone at the USB port at the base unit. You can forward recorded messages to your cell phone to access them when not at home or office. It allows you to block up to 250 numbers and features a one-touch cell phone pairing. The 1.8-inch clear backlit LCD displays the 3,000-number phonebook and other caller information. Get up to 18 minutes of voicemail storage. Its energy-saving mode increases the talk time. Buy now from Amazon With this phone, you can link up to 3 handsets and pair it with your cell phone using the Bluetooth. Integrate up to two cell phones and integrate them into the phone system. This allows you to access saved numbers in the cell phone from the handset hassle-free. Its text-to-speech function makes it possible to hear who is calling without having to look. The telephone answering device (TAD) makes this the most efficient and advanced phone on the market. Buy now from Amazon Get two handsets with this system to make your life easy as any of the headsets can answer the phone. It has screens on both the base unit and the handset for easy access to the caller ID or call-waiting information. It features a caller ID announce to call out the caller ID. The HD audio gives you clear calls from anywhere within the range. The handsets have a push-to-talk feature so they can work like walkie-talkies from room to room eliminating the need to shout. 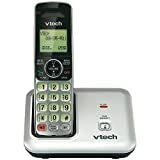 Buy now from Amazon Make every day calls easier and clearer with this sleek home/office phone. Its dedicated call block feature gives you a one-touch function to block up to 250 numbers. 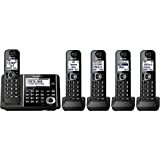 It can be expanded to 6 handsets making it reliable for call management. You can even use it as a baby monitor at home. It has a 100-number phonebook and a 2.5-inch LCD for the easy reading of caller and contact information. Its noise reduction feature makes your sound output very clear and it can store up to 17 minutes of voice messages. Buy now from Amazon When you use this cordless phone, you will experience the high-quality sound and interference-free conversations. It allows up to 12 handsets. It has a long-range freedom and HFD audio for better clarity. It will announce the caller, so you do not have to get up to read it. Its digital answering system can record for 22 minutes, and you can retrieve the messages from any handset within the home. It can be placed on a table or mounted on a wall. There are two types of cordless phones, those with built-in answering machines and those without. All types use digital enhanced cordless telecommunication technology (DECT) and 1.9 GHz frequency that limits interference from other devices like microwave ovens. Those with answering machines are slightly larger and more expensive. They can record messages and let you listen to the caller before picking up. You can check for options like remote access, call screening, toll-saver, selectable number of rings, and speaker-volume control among other options. Another difference is whether it has a corded base to get power from the AC or uses backup batteries. A model with a corded base is ideal for areas prone to power outages. Number of Extensions: For smaller homes, a single-handset phone is adequate; however, if you have many rooms, you may need several handsets supported from the same base for easy reach. Since each handset sits in its charging cradle and does not need a phone jack. This allows you to station the phone wherever you want. Settle on the Features: Start by noting down the features you want before you go out to buy the cordless phone. Some come with caller ID, speakerphone, headset jack and ringer in base and handset. Keep in mind that the higher the number of features the more expensive it will be. Weigh Performance Factors: Cordless phones have very good voice quality almost rivaling the top-rated corded phones. When fully charged, most phones will give you up to 8 hours of talk time. Consider Usability Issues: Newer phones have improved usability designs. These include visual ringer, caller ID, talking caller ID, call waiting, easy to read buttons and volume booster, among other great features. Battery and Backup: A backup system is crucial for most cordless phones as they won’t work without electricity. They have different types of backup power to support operation when there is a power outage. Some models have battery holder; a compartment with the backup battery to come on when the main battery drains or when the power goes out. Cordless phones come with rechargeable batteries, but some use AAA NiMH rechargeable one that is less expensive and are readily available. Pager feature: When working with multiple handsets, it is easy to lose one, hence the need for this feature. By pressing a button on the base or charging dock, you can locate the handset from an alarm sound. Some models will warn you as you move out of range of the base station. LCD Screen: Many cordless phones and base have LCD screens. This makes working with the phone very easy. It can show your phone directory, caller ID, battery strength, and call time among other pieces of information. LCD screens are available in color and the basic black and white. Mailboxes: Most phones offer one mailbox for voicemails. However, you can get a phone with multiple mailboxes that allow you to designate where each message type goes. This feature is essential if there are multiple family members receiving messages on the same phone, or if you run a small business from home. This separates messages so users can listen only to those intended for them. Advanced Playback Controls: When the phone has advanced playback controls, you can easily navigate through the messages forward, backward, repeating or skipping messages. You can even have fast playback, slow playback or rewind a message. Some phones have audible message alert to let you know when messages are waiting for you even without looking at the LCD. Two-Line Support: Technology has allowed a single phone to have two-line support eliminating the need for two phones. This is beneficial for those running a small home business and wants to separate family and business phones. Some will offer distinctive ringers to help you identify which line is receiving the call at any given time. It also allows you to conference two callers in a three-way conversation. Headset Jack: Cordless phones can come with headset jack to facilitate hands-free conversation. You just need to clip the handset to yourself and use the headset to talk freely. Some models offer a headset jack at the base to prevent a drain of the handset battery. Auto-Talk: This feature engages when you lift the handset from the base. It automatically connects the call without the need to press any button. Some handsets may feature volume control for adjusting the volume during a call. Bluetooth compatibility: Many phone manufacturers are increasingly bringing the mobile phone into the home phone. This is indicated by inclusions of features like Bluetooth technology that allows mobile phone calls to be made from the cordless handset. It allows for connecting your smartphone or wireless headphones with the cordless phone. Some have features like pop up notifications when your smartphone has a text. There are plenty of possibilities with this compatibility. Call Clarity: Everyone wants better call quality whichever phone they use. Home phones usually have better call clarity than cell phones. However, not all cordless ones maintain this quality. Different models transmit to the handset in varying clarity levels. Range: The distance you need to move from the base station is crucial, especially if there are walls that could limit the distance. Most cordless phones have a range of 200 to 300 feet that is adequate. Charging Time: Consider cordless phones that take a shorter time to charge. This can minimize any inconvenience when you spend a lot of time on the phone. Every minute it stays charging is a minute you cannot use it. The fastest charger works at an average of seven hours to fully charge the handset while some take as long as twelve hours. Answering Machine Recording Time: Models vary in how much space they have for storing recorded messages. Some can hold 17 minutes while others have a longer recording time of up to 30 minutes. Warranty & Support: Consider things like the warranty length so you can have plenty of time to notice any factory defects. Check the available support avenues in case you have an issue. Is there an elaborate FAQ section on the product’s webpage? When there are many options to get customer support, you will be at peace. With the advancement in technology, landline phones have improved in quality and versatility. It is now easier to stay in touch with family, friends, and business clients. They come with different combinations of features and designs making it confusing to choose the right one. This guide, however, is put together to help you overcome the challenge and find the right phone.